Where to go for steak in Tokyo? 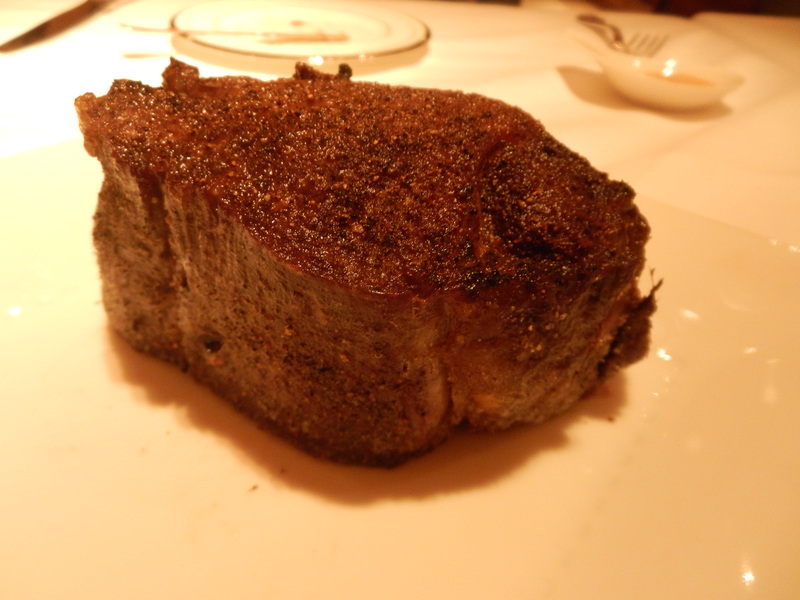 If our clients ask I suggest great steakhouses like the New York Grill at the Park Hyatt Tokyo. Especially now as an Argentine executive chef, Federico Heinzmann, is overseeing the kitchen. Ukai-tei in Ginza or Omotesando also is a crowd-pleaser. These are restaurants that we save for a special occasion and not spots we can pop into when we are craving a juicy steak. Ikinari is a fun Japanese word that means all of the sudden or out of the blue. Ikinari Steak is a chain of tachigui, restaurants without chairs, yes, stand and eat restaurants. These are often casual spots where diners pop in for a quick and affordable meal. 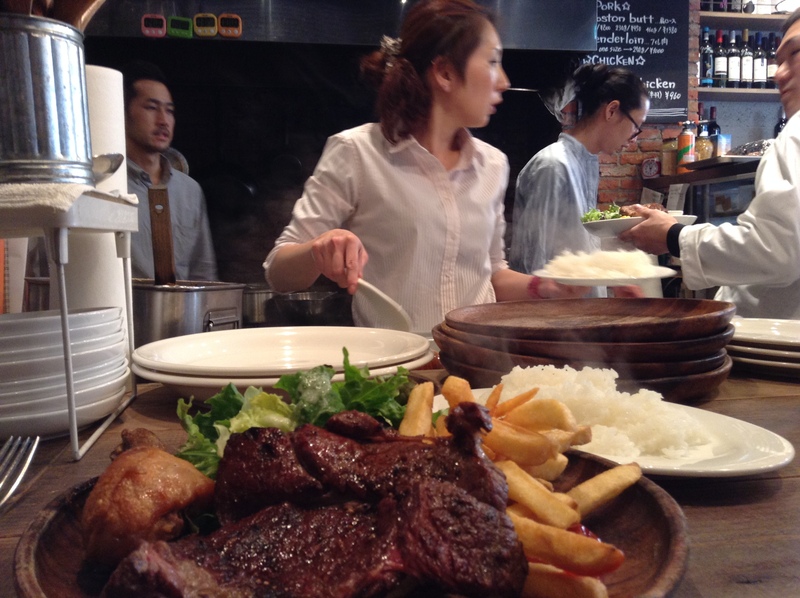 At meal times, usually around noon for lunch and about six p.m. for dinner, Ikinari Steak often has a line of customers waiting to get in. 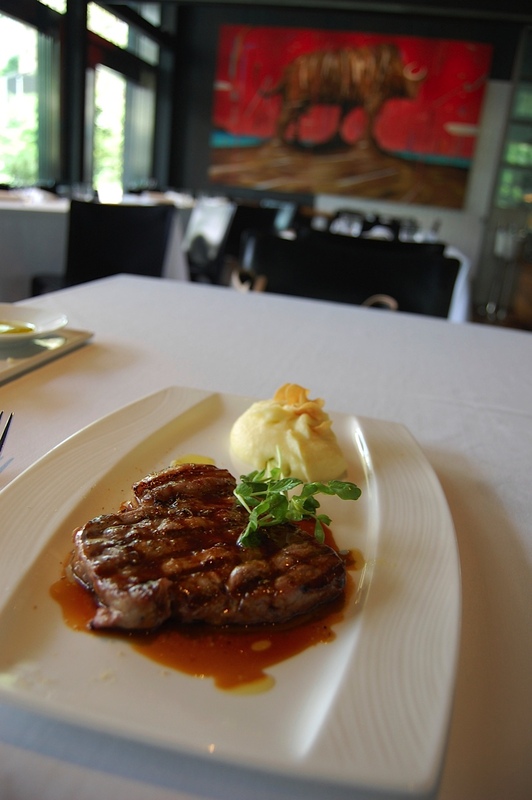 The menu offers a variety of steak cuts such as filet, rib roast, or sirloin. The beef is Japan as well as the US. Diners go to the kitchen and specify which cut and which type of beef they want and then the chef puts the steak on the cutting board and asks you how thick you want the slice to be. After he cuts the meat is weighed and diners pay per gram. The steak is then grilled over charcoal and then the staff will bring the steak and any side dishes to your counter. Silverware and condiments are on the counter. See the menu on the link below. Of course this steak can’t compare to the best steakhouses in Tokyo. It does hit the spot when the craving comes for a juicy steak. It is a very casual environment and great for solo diners. 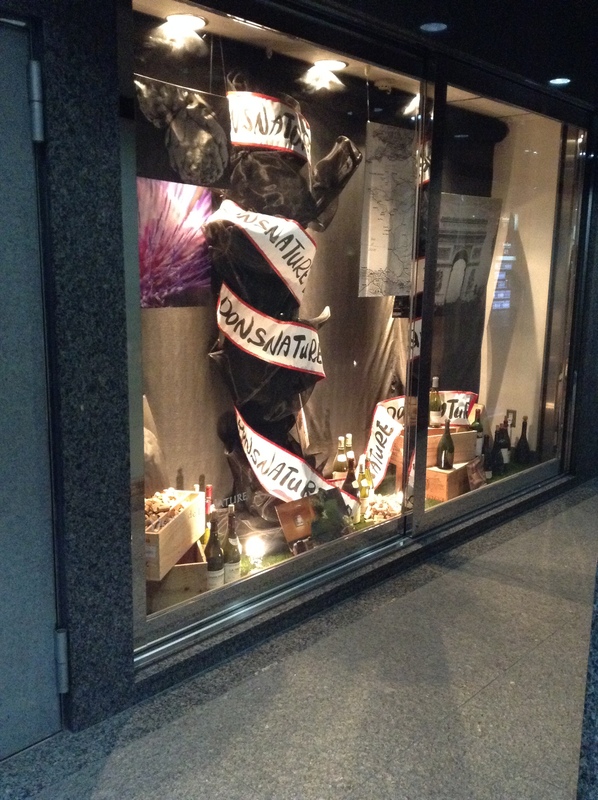 This shop was in Shinbashi but there are branches throughout the city, including Ginza, Shinjuku, and Shibuya. I believe the company is expanding and the market seems to be hungry for it. 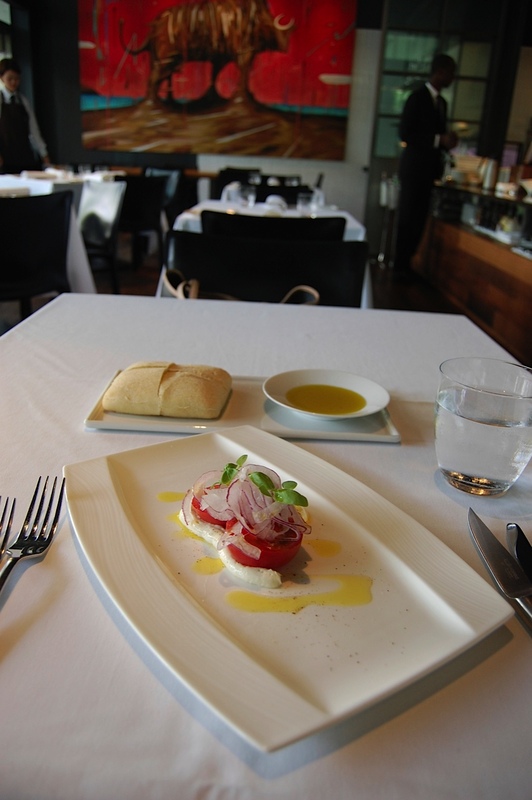 Fermintxo Boca is a lovely Spanish spot hidden behind the escalators on the first floor of the Ark Hills South Tower. Lunch, which includes an appetizer plate, main dish, and coffee, is a bargain starting at 1,200 JPY. 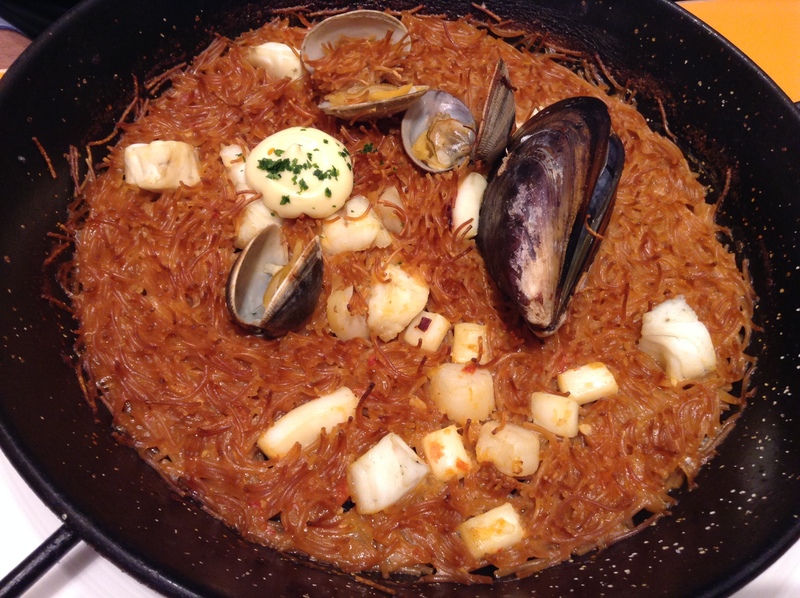 The pasta paella at lunch is made with splinters of angel hair pasta cooked in a rich seafood broth studded with scallops, squid, and shellfish. The aroma of the ocean filled the table when the large dish was set down. 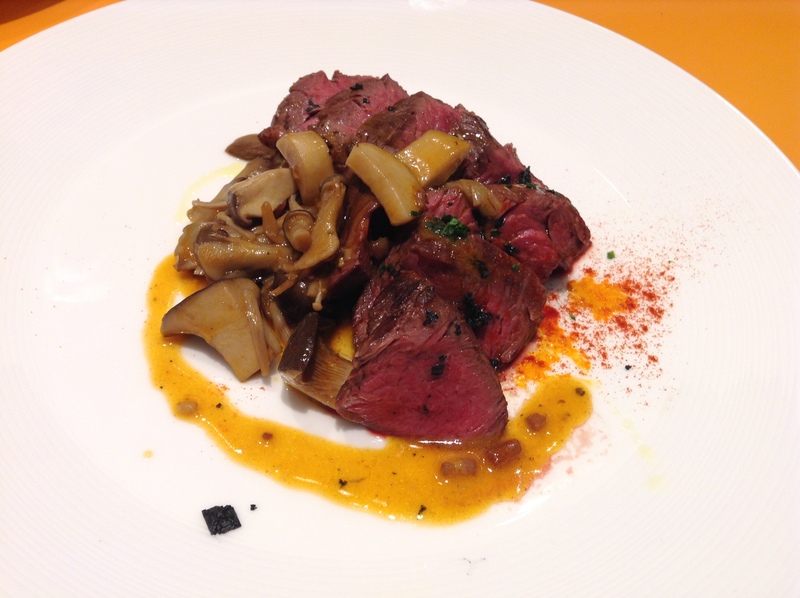 The steak is seared on the outside and red on the inside, perfectly paired with meaty mushrooms. The restaurant is usually full at the peak noon lunchtime, so go early or late. It’s casual here and at this lunch it was filled with ladies, so lots of chatting. Staff are friendly and welcoming. Fermintxo Boca is also getting a lot of press lately for its sandwiches, so I will be back. This is a great spot for lunch. It’s a small restaurant, and fills up quickly. There is a counter overlooking the open kitchen, great for solo diners. 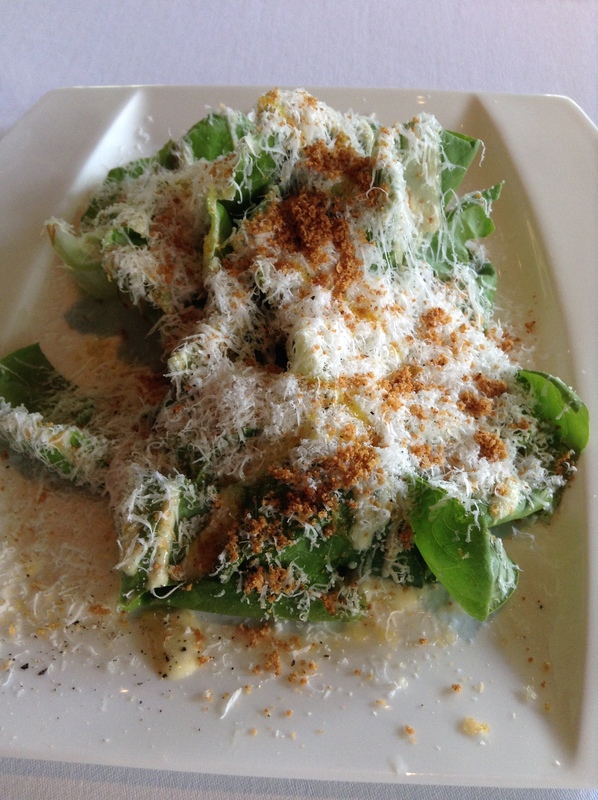 Fermintxo Boca offers a great value at lunch. 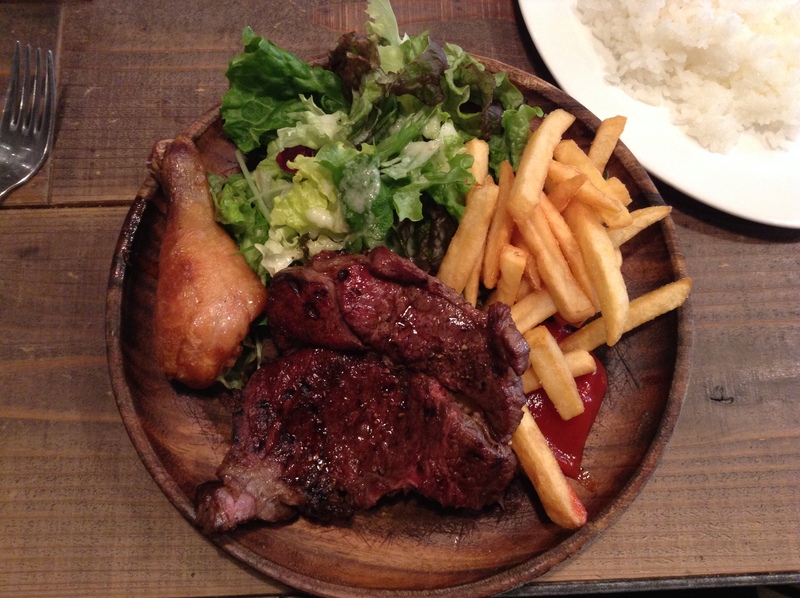 The assignment came from my boss in London, to seek out and eat the best steak in Tokyo. Tough assignment from Chowzter, but Shinji and I were up to the challenge. We were surprised when we called Dons de la Nature and got in within a few days. Seems that this restaurant is not yet on everyone’s radar. 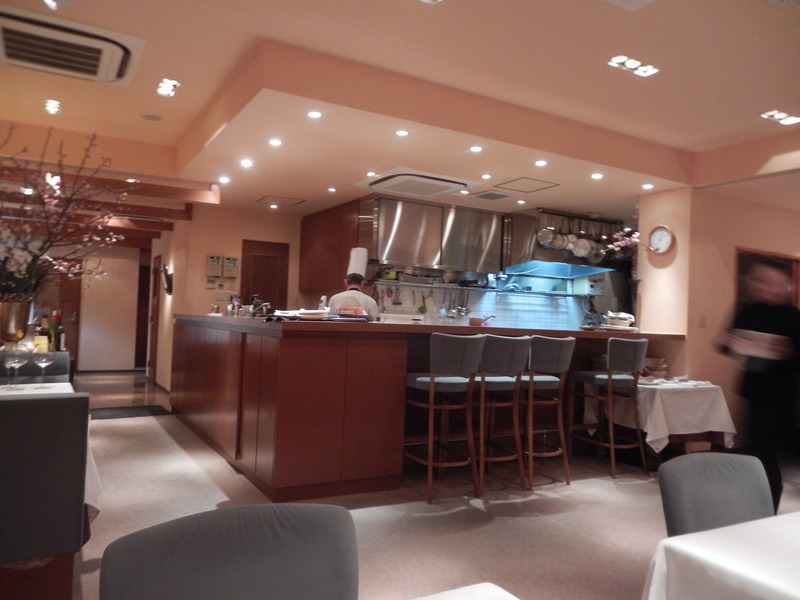 The restaurant is located in an unassuming basement on the main Chuo Dori street in the Ginza shopping district. Walking into the corridor leading to the elevator we feel as though we are in the wrong spot, until we spot the window filled with wine bottles and the name of the restaurant. We arrive and the okami-san (female manager overlooking the front of the house) is very friendly and down to earth. She takes our jackets and brings us to our table. Saga sirloin on top and Yonezawa filet on the bottom. This evening there are only two options of steak, a filet from Yonezawa in Yamagata and a sirloin from Saga. The sirloin is highly marbled and has more fat than meat. 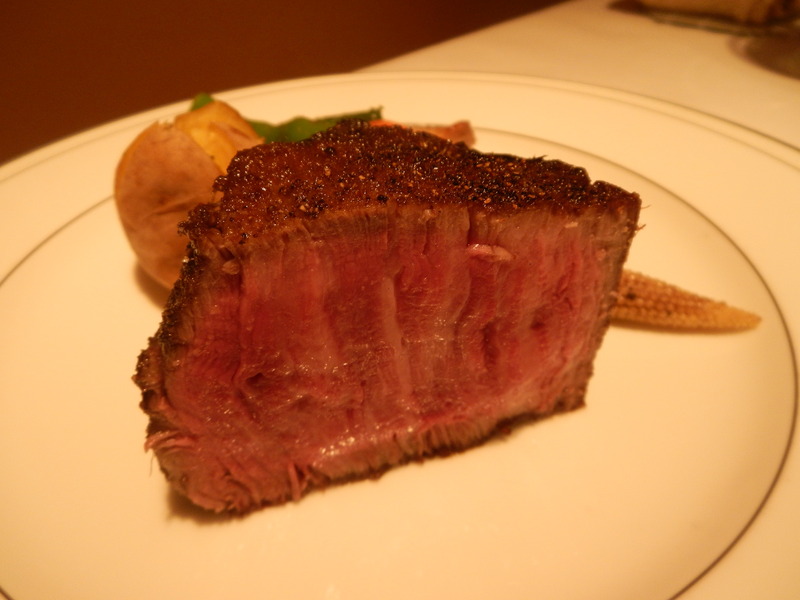 The filet, while meaty, still has a nice amount of shimofuri, the white fat that is flecked throughout the meat. The steak is cut into 400-gram portions and cooked in one piece before it is cut and shared, so couples must agree on the same cut. The sirloin looked too fatty so we agreed on the filet. 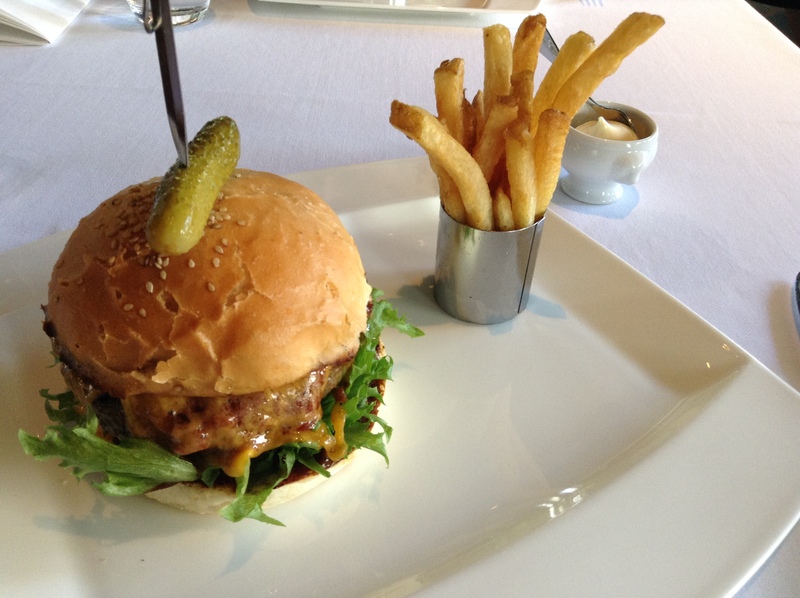 While the interior is tired and service is casual, the cuisine on the plate is taken very seriously. Chef Otsuka trained as a French chef and it is reflected in his carefully assembled salad topped with fresh crab legs, Japanese tiger prawn, and salmon. The consommé is classically made and I quickly forget about the environs and focus on the food. 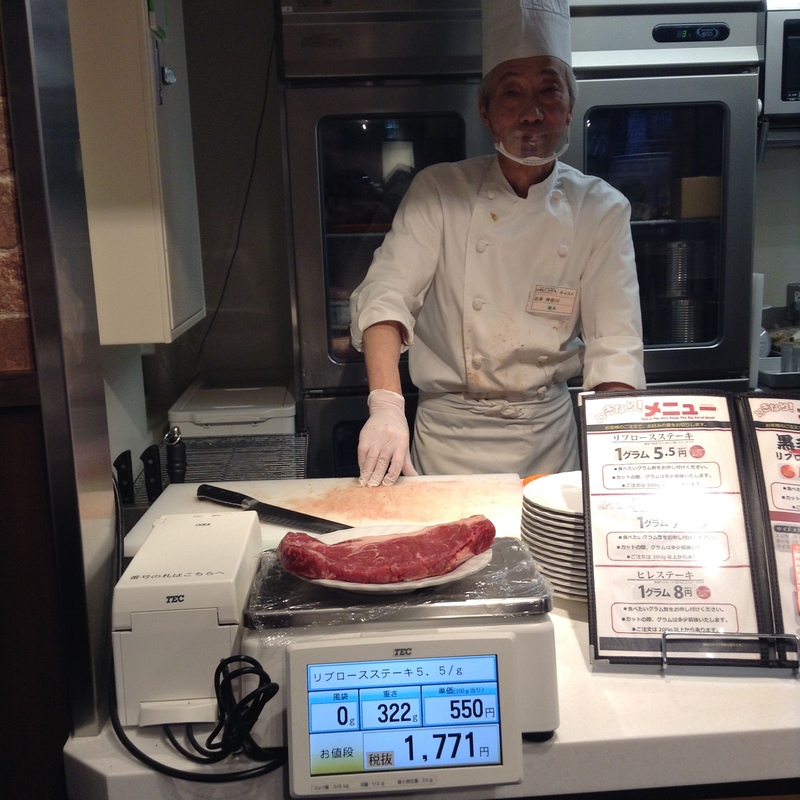 The steaks start at about 30,000 JPY each ($300 USD) which is shared between two people. That is before soup and salad. 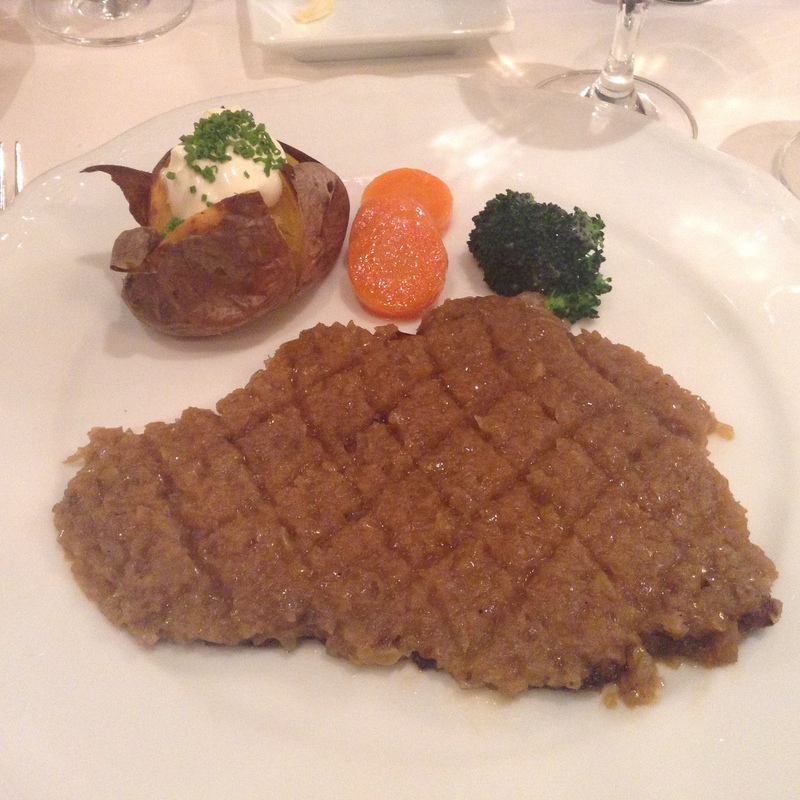 There is also a course menu which starts at 21,000 JPY per person. We took wine by the glass but there is also a long list to choose from of mostly French wines. The raising of kuroge wagyū (black-haired Japanese cattle) in Japan is very different from what you’ll find outside of Japan. The cows are grass-fed the first eight months of their lives. Each farmer selects the feed he believes to be best for the wagyū, such as soybeans or corn or straw. The last four months of their lives the cows are not fed straw anymore. We asked chef Otsuka if it is true that wagyū are fed beer and he said some places do, but that it is actually quite rare. But, he did confirm that wagyū are massaged daily. This is what helps to give the beef the shimofuri marbling that it is so famous for. Chef Otsuka came to our table and talked about how he selects his wagyū. He only picks the best that he finds at the wholesale market so his inventory is constantly changing. He has no preferences or loyalties to any region, but will pick what is the best that day at the market. 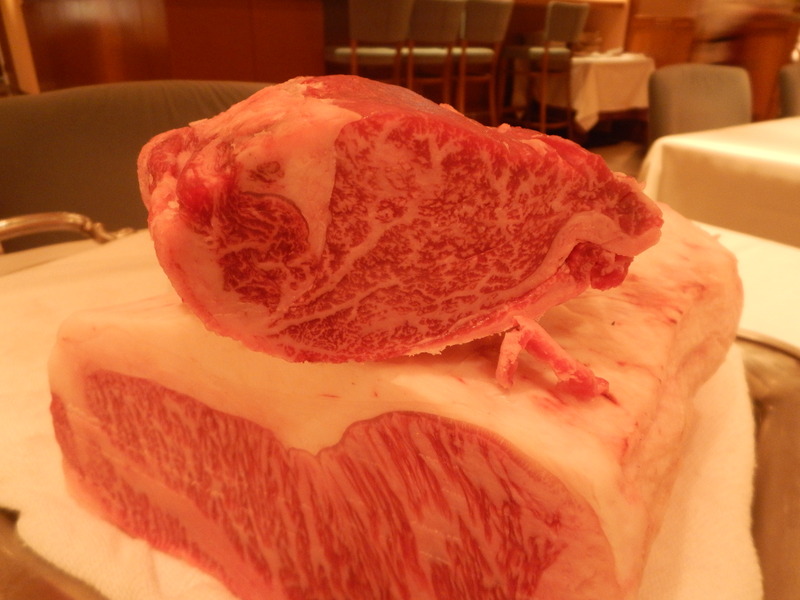 The wagyū is first dry-aged for one month, increasing the natural umami in the meat. The second month it is wet-aged. At this point the fat in the meat turns into amino acids, adding even more umami to the meat. The aging is all done in-house. Chef Otsuka could see that we were so curious about our dinner as we peppered him with questions and he generously invited us into his kitchen. The meat is skewered and then cooked in a kiln that was custom built for the sole purpose of grilling the meat with intense heat. The charcoal used at Dons de la Nature is made from Kinshu binchotan. Binchotan is a charcoal made from a Japanese oak tree. And, while many places may say that they use binchotan for grilling, the best quality binchotan is said to come from Kinshu, and the stock is very limited. Some binchotan is not even Japanese. We were told the binchotan can bring the oven to a temperature of upwards of 800 to 1000 degrees Centigrade. Chef Otsuka seasons the wagyū with salt and pepper, skewers the steak, and then puts it into the kiln over the binchotan. He then closes the kiln and listens for the sound of the fat in the wagyū melting and falling onto the hot binchotan. The charcoal then starts to smoke, adding another layer of flavor to the steak. An Argentinian chef friend of mine recently told me about the seven ways to cook meat in Argentina and one of the methods was in a similar kiln. I wonder if this is where chef Otsuka came up with the idea. The recommended serving for the steak is medium rare. The outside is just seared in the middle is still red. The steak is presented whole and then is cut at the table into two pieces for each person. The steak is incredibly rich in umami. The contrast in texture from the crispy seared outside to the tender, rare inside is a treat. As the steak is marbled with fat it almost melts in your mouth. After my first bite “oh my God” came out of my mouth. I didn’t realize it until I heard the okami-san laughing. It was, hands down, the best steak I have ever had in my life. In speaking with chef Otsuka after our meal he said what makes his steaks so unique is the searing in the custom-made kiln. 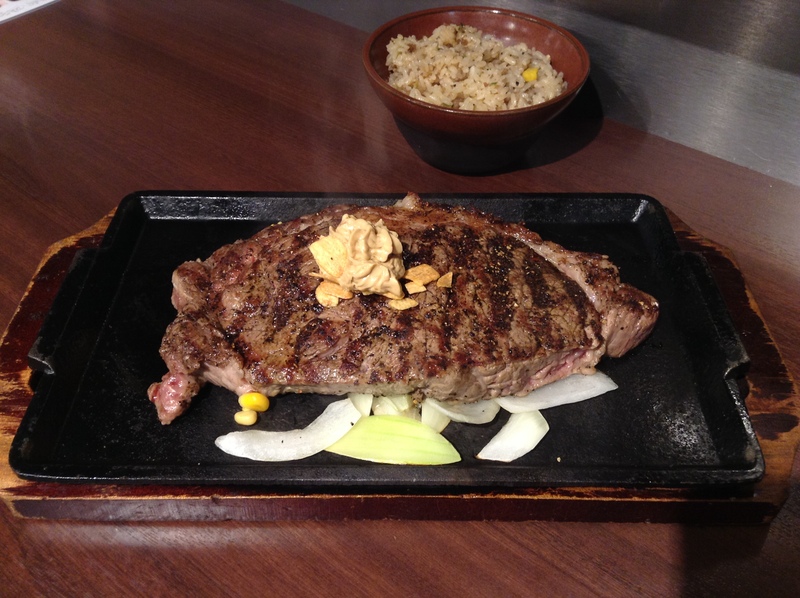 Otsuka explained that most restaurants cook steak in a pan over a gas heater and that the sauté pan can only get up to about 250 degrees Centigrade. He also said that as wagyū is so fatty that when it is cooked in a pan that it is cooking in its own fat. 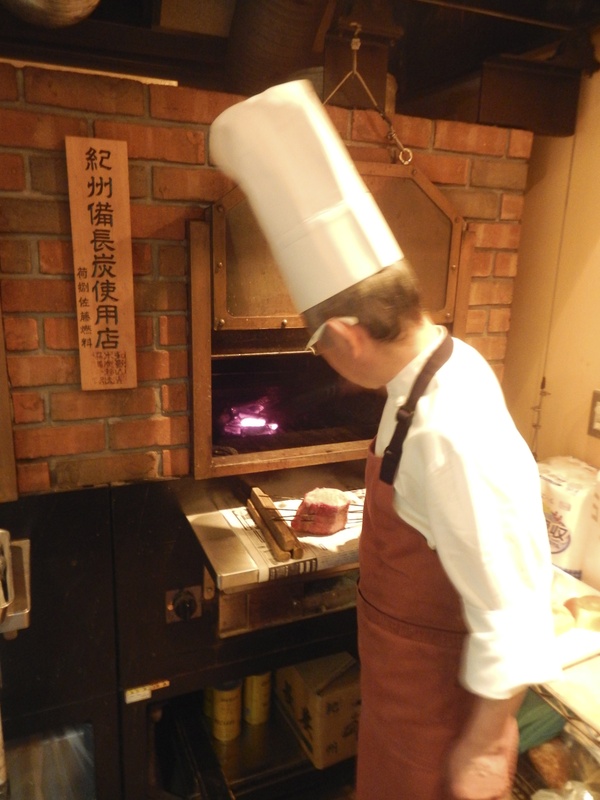 And, that the searing directly over charcoals is the method that he thinks is ideal for Japanese beef. This is what makes his steak the best in Tokyo, if not the best in the world. Monday – Saturday 5:00 – 10:00 p.m. 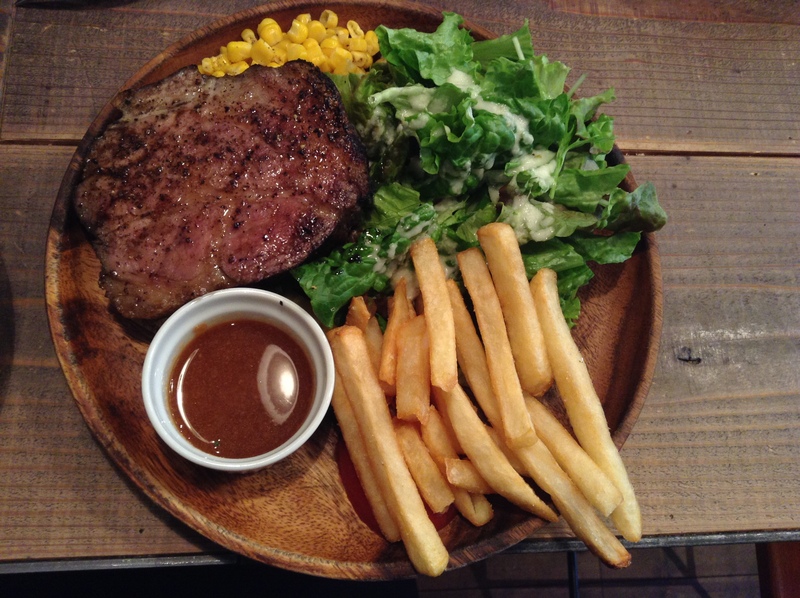 The lunch menu is very simple, the steak plate (900 JPY, photo above), roast pork (800 JPY), and a curry (500 JPY). The steak plate was a lot of food. I asked for a smaller portion of rice and am glad I did. The steak was medium rare, just as I like it. A meaty piece, not the tender wagyū that is prevalent throughout the city. Americans will feel back at home with this big cut of meat that is hot off of the grill. My neighbor had the pork and it looked good. Had I been in back in New York City I would have started up a conversation with him, but I didn’t. The curry also looked good so I have two more reasons to come back. My seat was at the counter and as a chef it is always fun to see the action in the kitchen. The food was great, and at this price, one can’t complain. I wish the meat was seasoned with a bit more salt. And, it is too bad that the salad isn’t tossed with the dressing in a bowl and then served. But, that is not keeping me from coming back. The wine list is very affordably priced and the dinner menu is a big one, and it makes sense to come back with a group of friends, order a few bottles of wine and share several different plates. Note, lunch is Monday – Friday only. On a recent visit I had the grilled pork plate, a bargain at 850 JPY. It is a thick cut of pork, my cut had a rich amount of fat as well. It was well seasoned and I prefer it to the steak plate and will be back for this dish. This day I was seated at the counter, at the same spot I sat at last time. I was the only woman at the counter. My counter mates included two men working for a delivery company, both who ordered extra-large portions of rice, which can be had for no extra charge. 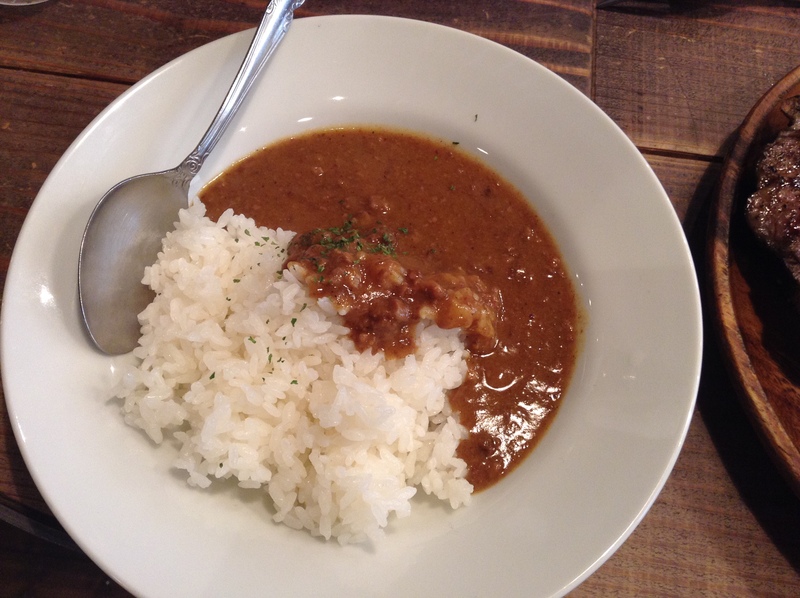 One option is to add curry to your rice plate for an additional 50 JPY. Do it. It is a smoky curry that is unlike any curry I have had in my years in Tokyo. The rice serving is very generous, geared towards the area salarymen which make up most of the diners at lunchtime. This portion is a half size and I couldn’t even finish this. Be sure to grab a complimentary cup of coffee-to-go on your way out the door. Smart idea of the restaurant to include coffee with lunch, but only as take-away. Mon.-Fri. 11:30 a.m.-2:30 p.m. and 5:00-11:30 p.m.